Properties in Fredericksburg average 4.8 out of 5 stars. Property 8: Dog-friendly cabin with a fireplace & tasting rooms on-site! Abby's Guesthouse + Pool: Featured on HGTV, 1 block from Main. Property 14: Abby's Guesthouse + Pool: Featured on HGTV, 1 block from Main. Sweet Escape- Historic Rock Estate Home with Pool & Hot Tub-1 Block to Main! Property 15: Sweet Escape- Historic Rock Estate Home with Pool & Hot Tub-1 Block to Main! 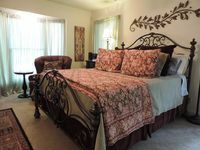 Property 20: Charming Chocolate Diamond, 2 blocks from Main St with private hot tub! Property 30: Romantic, dog-friendly cabin with on-site courtyard, close to wineries! Just a 1/2 block from Main Street, a sweet 2 bedroom, 2 bath w/private hot tub! Property 34: Just a 1/2 block from Main Street, a sweet 2 bedroom, 2 bath w/private hot tub! The Champagne Room. 618 sq. ft. guesthouse with kitchen bathroom and hot tub!!!! Property 36: The Champagne Room. 618 sq. ft. guesthouse with kitchen bathroom and hot tub!!!! 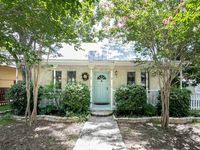 Property 41: An art filled, 120 year old limestone house, 4 blocks from Main St.
Property 49: 'Valley View' 1BR Fredericksburg Cottage w/ Views! Could not have been nicer. Major hotels don&rsquo;t have beds any more comfortable than this one. Nice, convenient and very clean. Great little cottage well stocked kitchen.